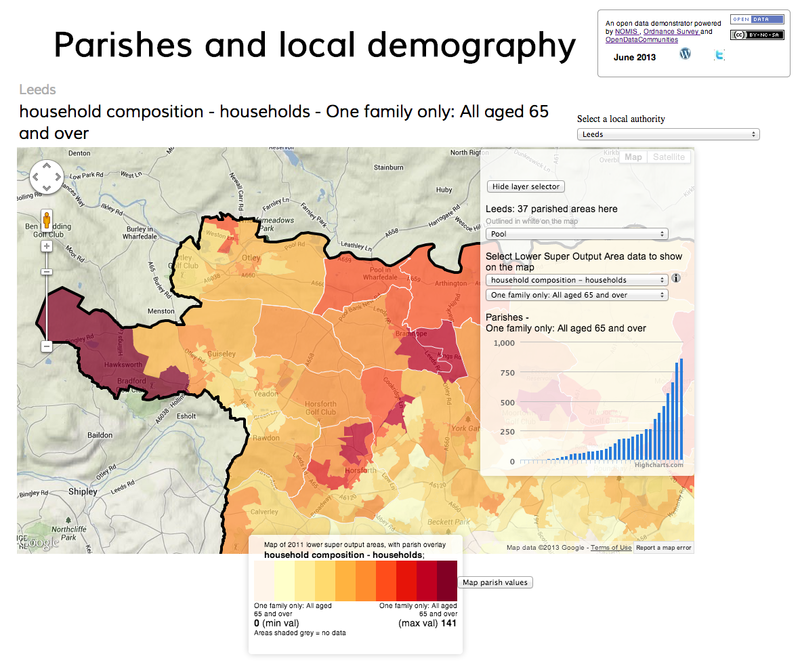 I wanted to tell you about a new app I’ve developed which brings together various open data sources about the demography of parish councils and related local areas in England. You’ll find the app here. Why have I built this? Along with other local organisations, Parish Councils are beginning to play a much more significant role in shaping and delivering public policy and services in their local areas. One good example of this is Neighbourhood Planning. I’m therefore thinking that smarter access to data is valuable for Parish councils themselves, their partners, and local communities to support more effective, collaborative and better informed policy and service delivery. There is now a significant amount of local data out there, particularly demographics from the 2011 Census, geographic data from Ordnance Survey, and deprivation from DCLG, where I work. I like a technical challenge. The app: what does it show, and do? I’ll start with a few caveats. First, I am not a full-time, professional programmer. As I’ve written elsewhere, my code is like my waistline: functional, but a little bloated. Second, I have written it in my spare time, and may have missed a few bugs or not displayed some of the data in the most statistically sound or meaningful way. Please get in touch if you notice any problems or think I’ve got it wrong. Geographic data from Ordnance Survey. This is a combination of content pulled directly from OS’s excellent Boundary-Line Linked Data service, plus various public ONS and ONS geographic boundary sets that I’ve crunched myself, and am holding as KML files. A range of Census 2011 sources at parish and neighbourhood levels, all pulled directly, in real time, from the superb NOMIS API. Data on neighbourhood-level deprivation and wellbeing, pulled directly from DCLG’s OpenDataCommunities service. There’s quite a lot to say about the various technical challenges I found and solved whilst joining up all this lovely data in the app – but I’ll save that for another post. Choose a different Local Authority, using the drop-down list in the top right hand corner. Note that the app works out by querying Ordnance Survey’s data whether the authority includes any parished areas. There are many that do not. Choose a different dataset, using the drop down menu just beneath “Select Lower Super Output Area data to show on the map”. You’ll notice that I’ve selected a subset of Census data, focussing mainly on housing-related topics. NOMIS provides many more outputs for you to explore, slice, dice and download in the format of your choice. For Census 2011 sources, also choose a variable from the dataset to show on the map. I’m also retrieving this information in real-time directly from NOMIS. Visit and interrogate the data at source, by clicking on the “information” icon next to the dataset name. 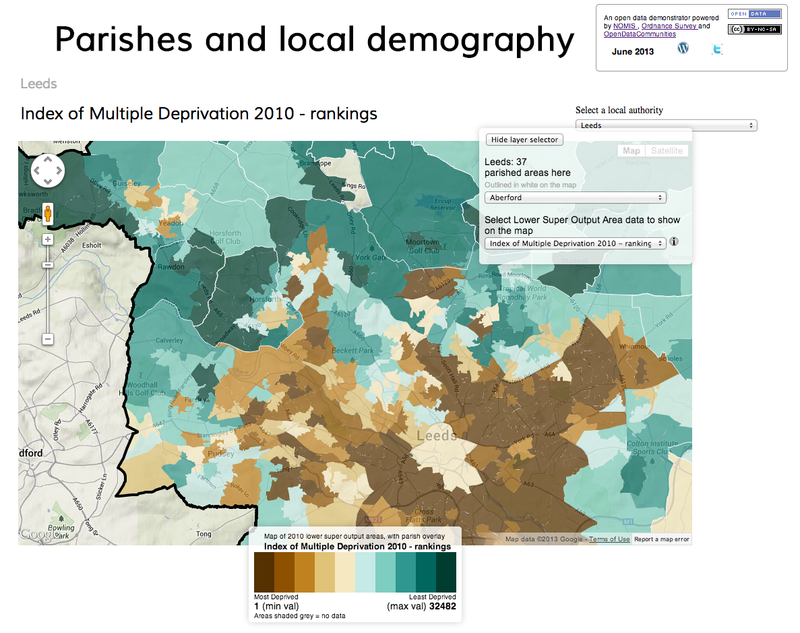 Also for census sources, show thematic maps for data at parish or lower layer super output area levels. You can do that by click on on the button next to the map legend. Would it be possible to email you some questions please? It’s Sunday so quite understand if you would like to wait until tomorrow. My email is – “hclp@me.com”. Hi henry. Not sure if you received my email on sunday. Happy to answer your questions. You can reach me on open_data@yahoo.com or steve.peters@communities.gsi.gov.UK. thank you for following my work.